PROVERBS 16:9 KJV "A man's heart deviseth his way: but the LORD directeth his steps." 6By mercy and truth iniquity is purged: and by the fear of the LORD men depart from evil. 7When a man's ways please the LORD, he maketh even his enemies to be at peace with him. 8Better is a little with righteousness than great revenues without right. 9A man's heart deviseth his way: but the LORD directeth his steps. 10A divine sentence is in the lips of the king: his mouth transgresseth not in judgment. 11A just weight and balance are the LORD'S: all the weights of the bag are his work. 12It is an abomination to kings to commit wickedness: for the throne is established by righteousness. 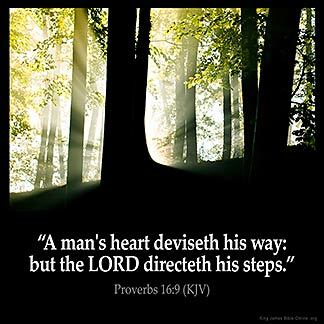 A mans heart deuiseth his way: but the Lord directeth his steps. 16:9 Deviseth - Proposes what he will do. Directeth - Over - rules and disposes all his designs and actions. My thoughts on this: When a man decides to marry and chooses his soulmate, and out of nowhere his soulmate chooses to end the relationship then, Proverbs 16:9 is protecting this man from his heart that sadly chose the wrong soul mate leaving God to guide his life, for his real true love. it gives me something to think about. My heart may think out and understand to go and or do a certain thing but the Lord may and does most of the time direct me a different way. The Lord directs my steps . Establishes my way. I want my Lord to direct my steps because His way is best.